I got my Master's Degree in 2005. You get a fancy hood to wear when you get a Master's degree. 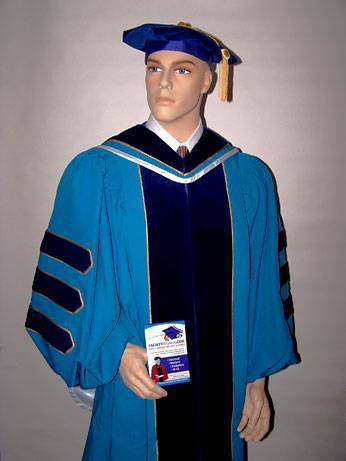 It has the color of the school from which you are getting your degree. I always get Light Blue for Education. Really not my first choice, but Hey. I wasn't consulted when the colors were handed out. What I wanted though, was not the morterboard thing I had to wear on my head, but the velvety hat I saw other people wearing. I leaned in toward Terrance and said "Hey, How do you get one of those Hats? Cause I want a velvety Hat!" The answer was to get a Phd. So I plan on rocking the Hell out of a Blue Velvet Tam about this time Next year, Peeps. Gives me time to find some seriously smoking shoes to match. and I believe knowing your penchant for shoes, you will find the most rockingest pair! !